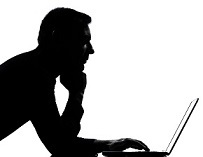 This article answers the common question of "how should I allocate my TSP based on my age and other considerations?" How do I invest my TSP? The mainstream answer to this common question is that it depends your situation and your preference for risk with the caveat that more risk equates to higher returns. Thanks to mainstream advice, investors wrongly equate higher risk to higher returns and end up taking on more risk (and losses) than they should. My view on how on should allocate depends on your situation and the level of risk in the markets. The level of risk in the markets is not the same as your preference for risk as commonly asked by financial advisers. Market risk is not static, so simply setting your portfolio to an allocation based on some generic questions from advisers about your "preferred level of risk" is quite frankly a little ridiculous and dangerous. I see this as no different from the car salesman starting with the question of "how much monthly payments can you afford" to help you pick out a car. The answer does not benefit you. But we need a starting point for the discussion on how to allocate so let's took a look at how the Lifecycle funds set allocations based on years-to-retirement. What is not considered in the following discussion is whether a person has excessive wealth or other retirement income sources that would allow for taking more risk. An individual with fewer retirement resources needs to be more risk adverse than someone who is in effect is investing money that will in all likelihood become an inheritance. An important factor that affects your situation is the number of years you have to retirement. I do agree with the premise that as you approach retirement your allocation percentage to stocks should diminish. To help our discussion, I looked at the TSP and Vanguard lifecycle funds to see how they invest based on years to retirement. I go more in-depth in the Lifecycle Details section but to keep it simple, I developed the following table below. Again this is a rough guide based on the professionally managed TSP lifecycle funds. I believe Vanguard's allocations are currently too aggressive especially as one closes in on retirement for buy & hold investors. Everyone's situation and preference for risk is unique, but hopefully this provides you a starting point for making your own allocation decisions. in 2016 and 41% in 2017, all others remain roughly the same. TSP's allocation percentage for 2020 was too high for near-term retirees since an investor retiring in 2016 year was invested at 50% in 2015 based on how Lifecycle funds work. While it is good the Lifecycle funds shift away from equities as one gets closer to retirement, I am still not a fan simply because they fail to take into account the changing risk of losses in the markets. The last two bear markets lost close to 50% of the equity fund's value which requires a 100% gain to return to even. The fact that the markets finally came back after many years does not justify the buy and hold mentality that the Lifecycle funds follow. Lifecycle funds did lose less than a 100% investment in stock funds since they had less exposure to stocks, but they also made less money during the bull (up) market for the same reason. Below I am going to discuss what I believe is a simple but better way to manage your allocations in the times we live in. I used my analysis of the Lifecycle funds as the baseline for the last section - a better way. Equity funds: To obtain a balanced portfolio of the total US stock market you would allocate 4 parts TSP C fund (SP500) and 1 part TSP S fund (rest of the US market). This ratio is due to the SP500 accounting for approximately 80% of the value of the total US stock market. If you go 50/50 with your allocation you are over-weighting small cap stocks. This may be appropriate at times or if you follow a seasonal strategy, but it may not be what you want. A 33/33/33 allocation among the C, S, and I funds would have the same unbalancing effect. Heavy small caps, heavy international, low tech exposure. Since the SP500 derives over 30% of its revenue from overseas operations, you are over-weighting international exposure. Since 60% of the SP500 tech sector's revenues come from international sources, you would be under-weighting the highest growth sector internationally. The TSP I fund is only weighted 6% tech, but heavily banks which today are on central bank life support. The small cap funds out-performed during the total 2009 - 2017 bull market, but have under-performed the TSP C fund since 2011. As of 2017 the small cap price to earnings ratio is running over 100% higher than the currently over-valued large caps. In other words, they have more to give back in a bear market and one would not want to be over-exposed to small caps at the wrong time. Yet you will find many who push the small caps because of past returns. As for the "safe investments", we have reached a point that I no longer think bond funds offer a good risk to reward value. There is a good reason why all the TSP lifecycle funds only invest 6% in the TSP F fund (AGG ETF) with the majority of funds moving in the much maligned TSP G fund as one approaches retirement. The TSP G fund has no risk of capital losses but always carries a similar yield to the TSP F fund. The only reason the F fund past returns were better than the G fund is due to capital gains from the declining interest rate environment we have been in since the inception of the F fund. Since the financial crisis, the global stock markets have become highly correlated. All global markets are moving the same direction but at different rates over different time periods. The bond market has become highly correlated to the stock market during this time in the medium and long run. Bond prices still move in the opposite direction during short knee jerk reactions to news, but since the financial crisis all financial assets have moved together. Why? Simple. The central banks have become the market. The central banks have dumped 12 trillion dollars into the global financial markets with money created out of thin air. They drove interest rates to a 5000 year low - negative rates! in much of the developed world which means bond prices are at a historical high. At the same time the stock market is approaching 1929 and 2000 stock market bubble levels once again. My measures are not based on the unreliable self-serving measures pushed by wall street, but by measures highly correlated to predicting future long term returns. What this implies is that diversifying with a stocks and bonds mix is not going to help as much as it did during the last downturns. If interest rates rise, both bond and stock prices will head down together. The best case is interest rates hold steady, but then you are left with very low returns on bonds going forward. Can the central banks prop up the markets indefinitely? They will try, but what we are seeing is that it takes greater interventions each time the market falters. At some point, something has to give. One of the points I am trying to drive home here is that the Lifecycle funds and mainstream diversification advice has benefited investors for a long time from the fact that both stocks and bonds have been in a long term bull market together. At some point, they will both revert to valuations that are normal historic valuations and they will move down together too. In this case, cash will outperform diversified portfolios by a significant amount. The Lifecycle losses will be smaller than the equity funds, but a loss is a loss. When out of equity funds (stocks) stick with short duration treasuries, money market funds, cash or the G fund for TSP accounts. Longer duration treasuries, high yield and even corporate investment grade bonds are speculative investments today and care must be taken. The 5 - 7 duration fixed income funds will not lose as much if interest rates rise as will the longer duration, but it will take less than a half of percent rise in rates for their capital losses to wipe out their annual yield. How I came up with my baseline numbers is laid out in the "Lifecycle details" section. 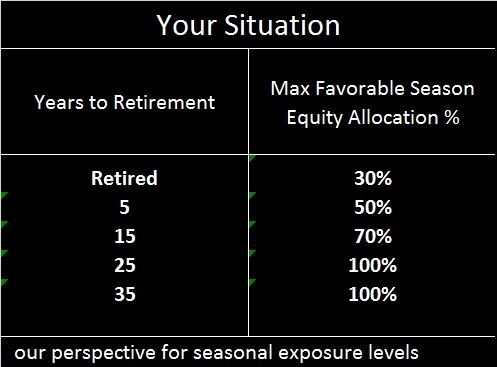 Our opinion is the seasonal strategy allows a bit higher allocation during the favorable months for equity funds, since we have no exposure during the historically unfavorable months for equities. If you remain a buy & hold investor you should set lower allocations to equities than this table by reviewing our Lifecycle details section in depth for a discussion on how TSP and Vanguard allocate.